Tag line: "Suspense and shock beyond anything you have seen or imagined!" Yep...Sometimes "inspiration" is as simple as that! Socialite Melanie Daniels (Tippi Hedren) decides to pay a surprise visit to Mitch Brenner (Rod Taylor), a new acquaintance who's spending the weekend in the coastal village of Bodega Bay with his mother, Lydia (Jessica Tandy) and sister, Cathy (Veronica Cartwright). Unfortunately, Melanie's arrival in town coincides with an amazing turn of events: birds of all species have started attacking the residents of Bodega Bay. The townsfolk do what they can to defend themselves, even as thousands more birds come flooding into the area with each passing hour. The threat of further attacks looms heavy over this small community, and both Melanie and Mitch come to realize that the only way they can ensure their survival is to leave Bodega Bay as quickly as possible. 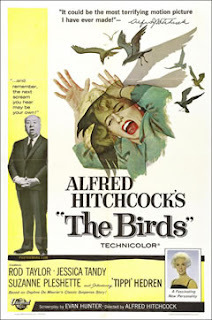 With The Birds, Hitchcock faced a real challenge: how to turn what are normally perceived as docile creatures of the sky into savage killers? Well, you have to hand it to him...he was certainly up for the challenge. Throughout the film, we're given close-ups of hundreds of attacking birds, their beaks pecking violently at bruised and bloodied hands. At one point, we catch a glimpse of an eyeless corpse, an unlucky victim of some rather hungry birds. Then there's the ungodly screeching that accompanies every attack, a sound so piercing it forces all other noise into the background. Birds crash into windows, break through ceilings, and make their way into Mitch's house through the fireplace. In this world Hitchcock has created, not even the family home is a safe haven; these birds will get you, no matter where you hide. One mystery continues to linger all these years later: why did the birds attack? Were they seeking revenge against the human race, or was it some sort of divine plague sent down from above, to terrorize the unlucky citizens of Bodega Bay? In the end, both Hitchcock and his screenwriter, Evan Hunter, agreed it was best to avoid any possible explanation, and keep the reasons behind the attacks a mystery. For my money, this was the right move. I've always found the unknown much more frightening, and the puzzling nature of each attack only works to heighten the tension. Besides...who's to say the birds themselves know why they did it? I guess the idea that it could happen in real life, and actually has, is horrifying. Although I think a few of the effects are a bit dated, The screeching really gets to me! On another blog,I read in a review that Hitchcock's film is similar to Spielberg's Duel. "about senseless, incomprehensible violence, about something innocent turning on the protagonist and seeking his destruction without any apparent reason." What an amazing scary movie docshock they don't make um like this anymore. A little surprised you didn't save this one for the chills segment. No one could argue on the birds just how monumental it was too horror. Proud to be a fan of the planet macabre podcast!!!!! #moviesandsongs365: I will agree that the effects are a bit on the dated side, but as you said, the fact that it can happen, and HAS happened, really works to the film's advantage. And the comparison with DUEL is an excellent one! Both films are creepy BECAUSE you don't know the reasons why, and both remain, years after they were made, just as effective as when first released. @Anonymous: You know, I was really tempted to hold this one back as one of my picks, but I decided against it. But you're right...it would have been a great one to cover. It's been a few years since I last watched it, but I noticed a relationship between the bird attacks -- and their increasing intensity -- and the interactions between Melanie & the women in Mitch's life. These women all want & need Mitch for one reason or another, and Melanie's arrival disrupts things. The hysterical woman who accuses Melanie of being responsible for the attacks might've had a point! @Ian: That's very interesting. I have to admit I didn't notice that as I was watching, but now that you mention it, there just might be something to that hypothesis. Next time I watch THE BIRDS, I'll be sure to keep an eye out for this. The last 30 minutes or so of The Birds is a nearly perfect template for Night of the Living Dead. I can almost guarantee that Romero studied this movie before making his own--the boarding up of the house, the attacks from outside from various directions, even the aftermath. The Birds is in many ways the first zombie film. @Movie Guy Steve: You're right...again, I hadn't thought of it before, but there are definite similarities between this film and NIGHT OF THE LIVING DEAD, and I wouldn't doubt that Romero did study THE BIRDS before setting out to make his movie. Thanks for the comment...again, very interesting. Episode 7 was great, nice change of pace reviewing all new horror movies. I think everyone hear is getting carried away with The Birts. It was a decent movie, but very fake looking. Hitchcock is an icon, but this is far from his best. Duel was so dull+drab, a guy driving for 90 minutes, I didn't feel the terror that should of come from a film like that. Doctor I love the announcement of dedicating 50% of your website to horror. Us horror fans sure do appreciate that. The Birds is a staple of horror! @PAcelicious: Thanks for stopping by, and for the comment. I enjoyed recording Episode #7, and I'm happy to hear you enjoyed listening to it! It was nice to focus on some 'newer' horror movies for a change, and there were definitely some good ones in there. As for THE BIRDS, I'll agree that it isn't Hitchcock's best film, but as for being fake-looking, you really have to take into account when the film was made, and what Hitchcock had at his disposal to make it. It obviously can't be judged on a modern level, when filmmakers are able to farm out effects to million-dollar computer companies (that said, I've seen computer effects that looked much more fake than anything in THE BIRDS...check out my thoughts on CENTURION for more on this). As for the movie itself, it's an engaging, well-told story, and in the end this more than makes up for any deficiencies there may have been in the special effects. I also can't agree with you on DUEL (though I will concede it's more of a thriller than a horror movie). The tension generated by Spielberg throughout the movie was more than effective, and Dennis Weaver did an outstanding acting job as a man pushed to the brink by a total stranger, without any idea of what he may or may not have done to spark it all. Thanks again for stopping by, and for the comment. I appreciate it. And thanks also for listening to Planet Macabre. Stay tuned...our next show is gonna be another good one! @Chaz: Good to hear from you again! Thanks for stopping by. Yeah, I'll definitely be focusing more heavily on horror in the coming months. While I can't say for sure it'll be 50%, I can guarantee a new horror movie will post at LEAST 3 times a week (I don't have a calculator handy to get the actual % that comes out to...it's close to 50%, but not quite). Thanks for stopping back in, and for the comment. It is certainly appreciated! Arising out of bed Doctor and I always look forward to your responses. You are so punctual and I really admire you here and on the podcast. The exact percentage is 42.84%, I'll take it. haha. Chaz: Thanks for posting the actual percentage. I knew it was close to 50%, but there's no way I could have wrapped my brain around that percentage without a calculator! Thanks for the kind words, and for stopping by (and you won't want to miss the next Planet Macabre episode...it's shaping up to be a good one!). I hadn't seen this movie in probably twenty years or more, and forgotten how poor some of the special effects are -- although it's probably as much a fact of how good special effects actually are today. I wonder if Hitchcock were making films today, with the aid of current special effects, what kinds of things he'd be doing? I think he really did have a taste for gore...but could never fully realize it in film in his day for both technical limitations and strict decency codes. @Klaus: Again, I think the special effects were indicative of the times. And yes, I've often thought how awesome it would be to see Hitchcock make a film with the special effects of today at his disposal. It's an interesting point you make about the gore. I only it could happen! I agree that they were right to leave the reason for the attacks a mystery. I don't know if that is always the case, because I like resolution. But leaving a little mystery often seems to work in films (also in Groundhog Day, etc.) rather than explanations (The Happening). @Chimesfreedom-Pophistory: Absolutely. There are times when I also like resolution, but in the case of THE BIRDS, it would have been a mistake. You already have so many comments on this movie, all I'll add is that I got the impression Hitchcock was implying Hedren's lovebirds were somehow responsible. She brings them to Bodega Bay, and that's when the birds start attacking. And then at the end, they decide to take those birds with them when they make their escape. I took that to be an ominous closure.